One of GIGABYTE's first B360 series motherboards in the Gaming 3 WIFI. This is our first review of this new chipset, and it offers users a cheaper way into the 8th generation Intel processors. The GIGABYTE B360 Gaming 3 WIFI includes many of the features found in the Z370 version, and even trumps it in one respect with its ultra-fast Intel CNVi Wi-Fi with speeds up to 1.73 Gbps. When the Z370 chipset came to the market, it was not enough to satisfy all potential buyers. As with every platform, Intel released (although this time several months later) a second wave of cheaper chipsets, allowing buyers to purchase inexpensive motherboards for the latest processors. These motherboards are not always for the enthusiasts, but will allow users to enter the platform at a lower price. To that end, all board partners have several boards in the H370, B350, and H310 chipsets to choose from. The GIGABYTE B360 AORUS Gaming 3 WIFI in our hands today offers users that lower-cost of entry along with quite a few features. At $120, about the only thing missing from a base Z370 board the Gaming 3 Wi-Fi is the ability to overclock. The board includes lightning fast Wi-Fi capabilities (to 1.73 Gbps) as well as USB 3.1 (10 Gbps) support integrated into the chipset. Many in this market are simply looking for basic features and a pleasing design aesthetic. While it may not have some of the extended shrouding visuals we see higher up the stack, its clear appearance and brushed aluminum heatsinks with orange accents work well for an overall neat system. There's also some RGB LED lighting around the board. It takes more than good looks and a solid feature set to entice buyers into purchasing a board, as performance counts even with a locked system. We ran the board through our testing suite to see if the system shines under the hood as well. Overall, the performance testing went without a hitch. Despite most Z370 boards implementing some 'beyond stock' performance, often called Multi-Core Enhancement (MCE), the B360 Gaming 3 WIFI was within striking distance of those that did not use MCE. Where the Gaming 3 WIFI really shined was in the power consumption testing. Compared to the other motherboards we have tested, it consumed around 20W less than the others. Regarding other features, the board comes fully equipped with support for two memory modules per channel with total support up to 64 GB and speeds up to DDR4 2666 (memory overclocking is not possible here). For storage connectivity, we see both of the common options of SATA ports as well as dual M.2 slots. The board has a total of six SATA3 ports and unlike its Z370 brothers, the B360 chipset does not support any kind of RAID. Users will have to add that through add-in cards or external solutions. The dual M.2 slots support both PCIe and SATA drives, though it is worth it to note the second slot (at the bottom of the case) only supports PCIe x2 bandwidth. The board does support AMD Crossfire setups across the PCIe lanes through the chipset, but not NVIDIA SLI due to lane burification limits on the platform. For connectivity, the back panel IO gives users a total of four USB 2.0 ports, three USB 3.0 ports (one Type-C), and one USB 3.1 (10 Gbps) port (red Type-A). We can also see the DVI-D and HDMI outputs for video, the Intel Gigabit LAN port, as well as a six-plug audio stack and a legacy PS/2 mouse/keyboard port. Perhaps the only thing missing is a SPDIF output. 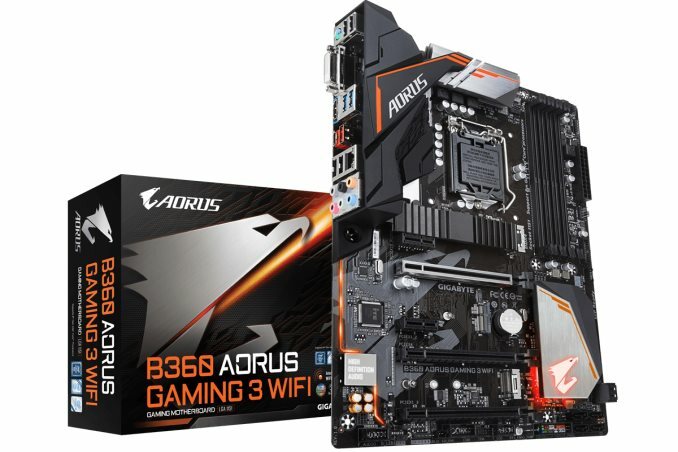 Pricing on the AORUS B360 Gaming 3 WIFI is currently $120 on Newegg.com. The board's direct competition from a price perspective is the ASRock B360 Gaming K4 ($118), ASUS ROG Strix B360-H Gaming ($115), and an MSI B360 Gaming Arctic ($125). Less than $10 separates these boards from each other price wise, with the main differences found in the number of SATA ports, the number of M.2 slots, the number of PCIe x1 slots, and audio/network controllers. GIGABYTE has brought forth a solid board with a lot of features at a reasonable price with which to build a system around. In the past, the cheaper chipsets were usually cut down versions of the main high-end chipset. This is no longer the case. The B360 chipset has native USB 3.1 (10 Gbps) support, unlike Z370, which allows motherboard partners to no longer need third-party USB 3.1 controllers to bring the high-speed connectivity, lowering the overall cost. Another significant change is in wireless networking. Normally, Intel wireless adapters and their RF elements are on a single module that fits into a standard M.2 E-key slot. These chipsets are the first in the mainstream desktop to use Intel's integrated connectivity (through CNVi technology) for wireless networking. This moves the control functions of the Wi-Fi modules into the chipset. The only thing board partners need to do is add a compatible companion RF front-end module, which is cheaper (but still adds about $15 cost to the final price). The fastest versions of these will allow for speeds up to 1.73 Gbps from the Wireless-AC 9560 CRF module, as found on the Gaming 3 WIFI. This is possible through the Wave 2 features such as 160 MHz channel widths and MU-MIMO. On the downsides with B360 is the inability to overclock either the CPU or DRAM, with the memory limited to DDR4-2666. B360 motherboards are also not RAID capable. 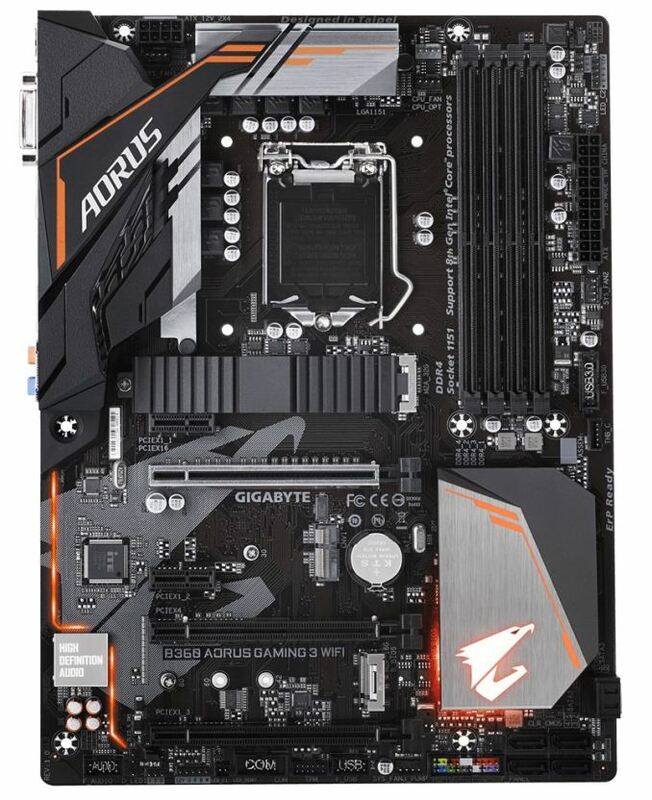 GIGABYTE has over a dozen motherboards for the B360 chipset, some of which are currently available at Newegg and Amazon. One important piece of information to note: technically these processors use the LGA1151 socket, also used by 6th and 7th Generation processors using the Z170 and Z270 chipsets. But due to several (albeit minor) difference in the pin-layout of these two sets of processors, the 8th Generation Coffee Lake will only work in Z370 boards and are not cross compatible. 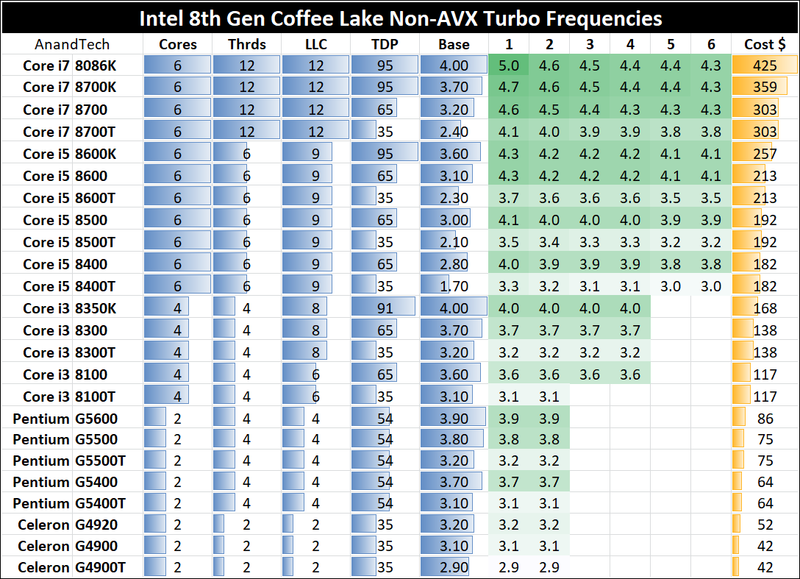 Back in October 2017, Ian Cutress reviewed a couple of processors (i7-8700K and i7-8400) in the Coffee Lake lineup - details on the rest of the product stack are listed below. I think there used to a PERCEPTION that you could get a decent board for 50 bucks, but that's probably because most 150$ boards looked similar to most 50$ boards. The latter is the Z68 board I still use. With then brand-new top-of-the-consumer-line i7-2600k. Some copy editing might be in order. Aside from the raft of grammatical errors (e.g. worth vs worthy of), random commas and typos (e.g. B350, i7-8400), specifications are contradictory. For example, page 1: "... a total [of] four USB 2.0 ports, three USB 3.0 ports (one Type-C), and one USB 3.1 (10 Gbps) port (red Type-A)." Page 2: "USB 2.0 (4x ports), USB 3.0 (3x ports) and a USB 3.1 Type-C port"
The typo mentioned RE: USB was corrected. Thank you for catching that.